Carrots come in a wide variety of colours besides the typical orange we see most frequently. 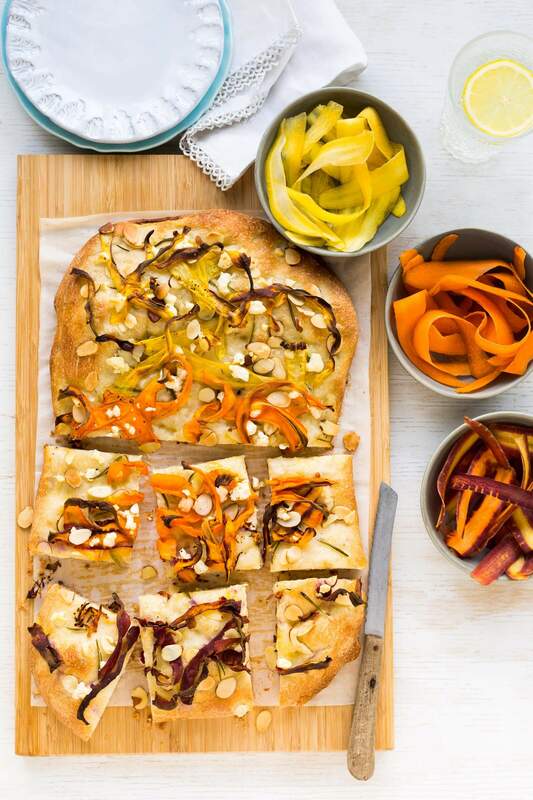 Beautiful purple, yellow, and even white carrots work really well in this easy Carrot Focaccia recipe. You don’t actually have to peel carrots because their skin is so fine. Just give them a good scrubbing under cold water and they are ready to go. 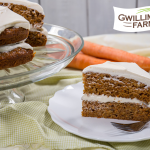 You can slice the carrots into fine ribbons using a vegetable peeler. 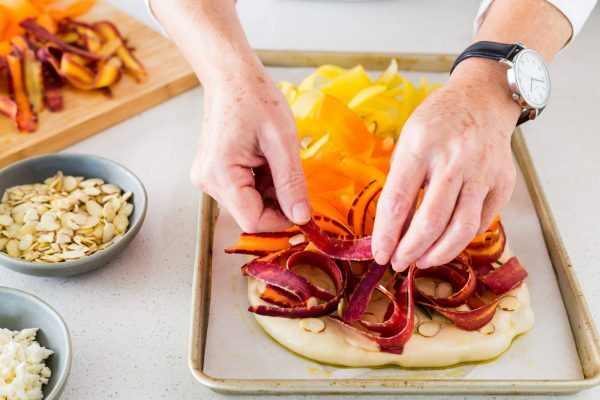 The carrot ribbons will toast in the oven as the focaccia bakes, yielding delightfully crispy-edged ribbons of sweet carrot. Defrost the pizza dough in the refrigerator overnight, then take it out of the fridge 1 hour before using. Line a quarter sheet pan with parchment, then brush it with half a tablespoon of olive oil. Press the dough out on the parchment-lined sheet until the dough almost fills the pan, then brush the dough with the remaining 1.5 tablespoons of olive oil. 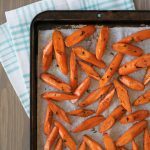 Cover with a clean tea towel and leave it in a warm place to rise for approximately 30 minutes, while you prep the carrots and the other ingredients. 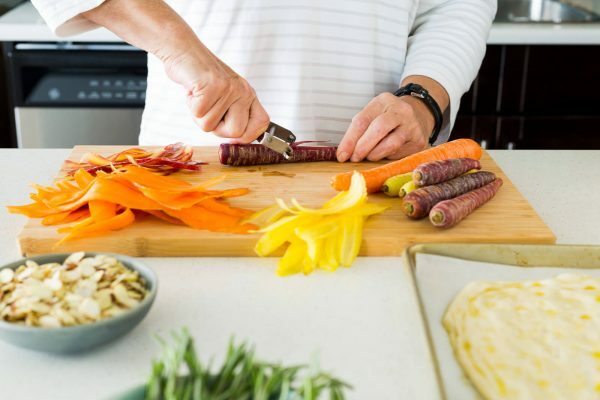 Using a vegetable peeler, slice the carrot into ribbons. Strip the rosemary needles from the stem. When the dough is ready, sprinkle it with the fresh rosemary and the sliced almonds. 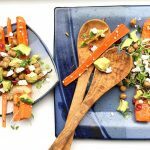 Top with the carrot ribbons, then crumbled feta cheese. Sprinkle with a generous amount of salt and freshly ground pepper. Bake the focaccia for 20 to 30 minutes until the edges are nice and brown. Drizzle with olive oil just before serving. Cut the focaccia into 12 slices and serve hot. Janice Lawandi is a PhD-chemist-turned-baker with a serious sweet tooth! 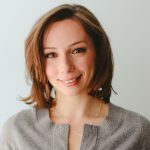 She works as a recipe developer and food stylist in Montreal, Quebec. To learn more about Janice, visit her blog Kitchen Heals Soul.